We arrived Sunday afternoon in significantly colder weather. Yvonne’s son Mike and his wife Veronica live in Jacksonville with their awesome kids, Myka, Megan and Luka. Luka was wearing a ninja outfit to greet us. “You can call me a Chinese bad guy,” he said. Monday I biked around town to get my bearings and to try and find some warmer clothes at thrift stores. Between a Goodwill and a Salvation Army, I found two pairs of pants, two long-sleeved shirts and a sweater, though no socks. If I was going to buy some, I wanted to get some striped knee socks, my favorite. This more than doubled the amount of non-cycling clothes I was now carrying with me. As someone who tries to be conscientious about “stuff,” I was pretty amazed how quickly I started accumulating more of it, as soon as I knew I wouldn’t have to carry it with me anytime soon. And how much I wanted to accumulate more. Jacksonville is small. I put in about eight miles going from one end to the other, including a couple of times around the town square due to confusion. But I was excited to find a yoga studio! Tuesday, I went to lunch with Dean Welch, the Wandering Wheels cyclist I met on the trip who had also been on O2K with Ben, and his wife Judy. We started out at the Three-Legged Dog cafe on the square, but moved on to the BBQ place a few doors down because it was so crowded. It took a little while, because Dean, who was the Jacksonville pharmacist for year, knew everyone. It turned out he also knew Yvonne from when she had been a nurse at MacMurray College in town, years ago! What a treat to visit with him and talk long-distance cycling, and to hear the news of the rest of the Wandering Wheels trip! It was also fun to visit their beautiful home. They have many lovely art pieces, and many from around the world that remind me of things Ben brought back from O2K. Later, Dean and I went on a 24-mile ride through the farm country surrounding town. He was great tour guide, filling me in on local industry and local color. We rode past a home where the owner had made his own versions of several war memorials, including the Vietnam Wall and the group raising the flag at Iwo Jima. They were really well done, but one had a little rip, and it looked like they may have been made out of duct tape wrapped around foam! We returned just in time for me to run over to a yoga class at Inner Harmony, which was great. Then after dinner, Dad and Yvonne and I walked over to the square to see the Clydesdales that had arrived to set up for a weekend festival. Dean and Judy were there, too, making me feel like a local after just two days in town! 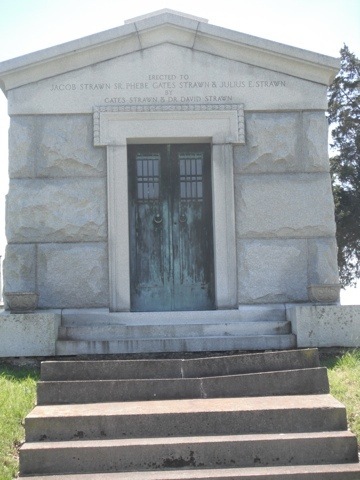 During the day on Wednesday, we visited family graves at the cemetery. It was interesting to see some of the older markers. A number of very old ones had also been more recently replaced with modern stones, perhaps due to wear or damage. Unfortunately, now they look less historically intriguing. 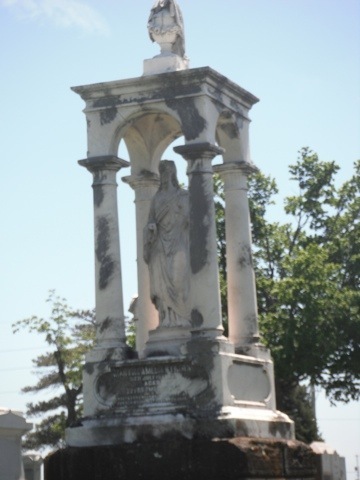 I took pictures of these two large monuments from a prominent local family, the Strawns. I later found out they are indeed relatives of my friend, Megan, in Seattle! 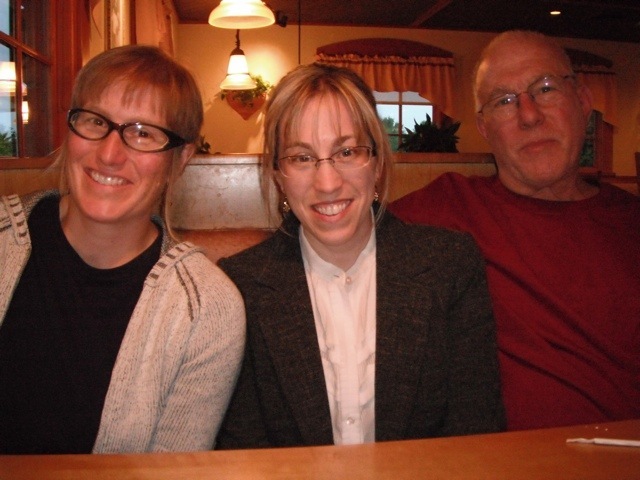 Wednesday evening, we drove to Decatur to meet my sister Katie, both for dinner and so they coud hand me over to her, so she could drive me on the next leg of my journey, to her house, in St. Joseph, Illinois. 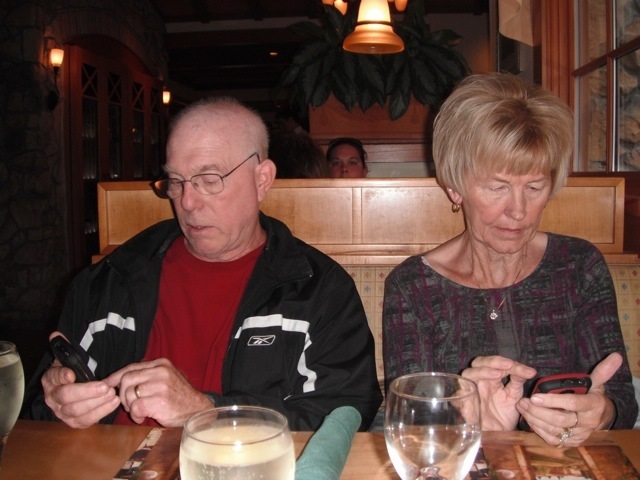 She was running late, so Dad and Yvonne had plenty of time to fiddle with new smart phones. This smart phone stuff is serious business! I had a wonderful time in Jacksonville. I could imagine living there, at least for a while. Though, so far, I feel I could be happy living practically everywhere I’ve been since November. I enjoy aspects of big cities, and others of small towns. Knowing a few people in town already certainly helps me feel comfortable with a place, as well as finding a yoga studio. So far, I guess that’s my criteria for finding a place to live. That doesn’t narrow it down very much. Christina Engel on June 13, 2011 at 5:38 am.